I am grateful for the opportunities for spirituality, study and travel, and for the support of community, family and the faithful friends whom I hold in my heart. Rejoice with me in praising God for all that has been and all that will be. Born in Madison, Wisconsin on January 2, 1933, Marlene Edwards was an only child until the age of fourteen. 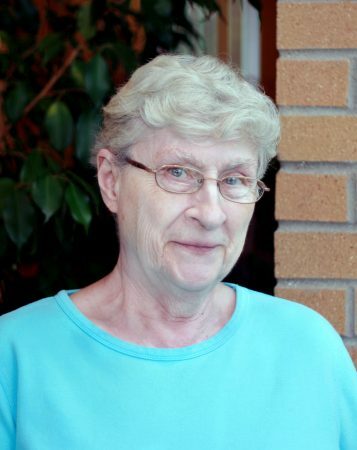 During her formative years, the family moved frequently, but Marlene always attended Catholic schools. She considered religious life in the fourth grade, and at age 17 she joined the Dominican Sisters at Marywood. Sister Marlene served as a teacher, elementary principal, pastoral team member and director of religious education in towns throughout Michigan and New Mexico. Sister Marlene earned a BA and an MA in Religious Education from Aquinas College, as well as an MA in Elementary Administration from Central Michigan University. After retiring from full-time ministry, Sister Marlene assisted the house coordinator at Marywood, served as a spiritual director, referral coordinator for Dominican Center at Marywood, and as a member of the Common Life Team. She currently resides at the Marywood Motherhouse where she enjoys reading, travelling, sewing, watercolor and painting. Sister Marlene leading prayers at Marywood Health Center Chapel of the Word. Sister Marlene Edwards help decorate bags for Kids Food Basket.